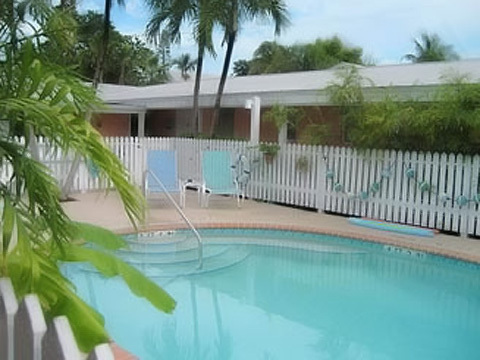 Ocean Breeze Inn provides an excellent location for your accommodations in Old Town Key West, with Duval Street and tropical South Beach just steps away. From our picturesque setting near the Atlantic side of this island paradise, you have excellent access to four separate public beaches and all of the historic sites in Old Town Key West. The Inn has only 15 rooms in two separate buildings, you can easily find privacy and seclusion here from the busy Duval Street activities. Tropical landscaping encloses our pool and patio area where you can enjoy full sun for sunbathing or choose a shady spot just for reading and relaxation. Within easy walking distance, you will find Duval Street, South Beach, tennis courts, the trolley stop, numerous restaurants and a small neighborhood grocery and deli. Blender, rollaway. Free pass available for Ft. Zachary Taylor State Park. Our Poolside Building consists of ten rooms, all on the ground floor, each with a private entrance from the covered walkway encompassing the pool and courtyard. Each room includes a beautifully restored wood vaulted ceiling and ceiling fan that adds the feel of Old Key West. Our Backyard Building consists of five rooms, each with a private entrance to a wood porch with patio chairs right outside your door. * Tropical White Wicker Furniture * Mini-refrigerator and microwave * Private Bath with Shower * Color Cable TV with Remote Control * Telephone with FREE local calling -- Data Ports * Wireless Internet Connection * Alarm Clock * Hair Dryers * Ceramic Tile Floors * Air-conditioning * Ceiling Fan * Non-smoking * Pool/Beach Towels * Daily Housekeeping Service * All rooms on ground level with private entrance * Free off-street parking * Complimentary Coffee Poolside Daily * Heated Pool (Pool Hours 9 a.m. to 10 p.m.) Shop for a local artist's unique creation or simply a charming treasure from Key West's many one-of-a-kind boutiques and street-side traders. Thrill your taste buds with delights from countless restaurants, open-air cafes and world-famous watering holes. Key West, an island city located at the end of US Highway 1, is known for sunny days and breezy nights. Thanks to the proximity of the Gulf Stream in the Straits of Florida and the tempering effects of the Gulf of Mexico to the west and north, our average temperature in winter is only 14 degrees lower than in the summer. Historical sites you won't want to miss include the Hemingway House, Lighthouse Museum, Audubon House and Truman's Little White House. Children will love the Key West Aquarium and Glass Bottom Boat cruises. Offshore lies the only living coral reef in North America with limitless opportunities for snorkeling, diving, and fishing. The Inn is located only one block from beautiful South Beach.